The Euro PS3 is the most expensive PS3 when compared to Japan and the USA. Fair enough I guess as we’re used to rip off Britain prices. Now Sony have announced that they have altered the backwards compatibility features of the Euro PS3. Altering means they have removed hardware from the PS3 to reduce costs. That blows. I’ve no real desire to play any PS2 games so it’s not the functionality loss that annoys me. It’s the fact that an inferior machine is being launched in Europe for a higher price. There is no justification for this apart that they can get away with it. Also annoying is that the reveal this just 4 weeks before launch when most of the pre-orders have already been placed. If Sony had any decency they would reduce the price, even slightly, for the PS3. I doubt they will though…the bastards. I should really vote with my money and cancel my pre-order. I may still do (OK…I won’t. Saying it though makes me feel slightly better). 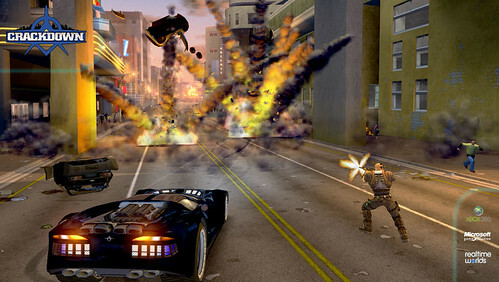 GTA4 is out October this year, however you don’t need to wait – just buy Crackdown. Thats probably a little unfair but it’s from the guy who devised the original GTA and it’s hard not to see the roots when playing Crackdown. You play an agent who’s task is to take back three islands who have been overrun with gangs. You start off with fairly basic skills and through more driving, shooting, fighting you build up your skills. Sounds pretty formulaic but there are some twists. Firstly there are agility orbs – the more you pick up the further you can jump and faster you can run. This really opens up the game. No longer is driving the best way to travel. The islands have height, lots of height and once you start to level up you can make incredible leaps. Secondly the cars evolve with your skills. Some can even drive up walls again making great use of the terrain. The game can also be played any way you like. Enemies taken out in any order, evolve only the skills you want to, take part in agility and car races…if you like. While the sandbox environment mimics much of GTA, Crackdown’s game engine delivers far more than GTA ever could. Finally a sandbox game with no pop-up and no other graphical issues that get in the way of the game. There’s nothing better than scaling one of the taller buildings, looking over the whole island and then jumping off, landing like Nero/Blade with the ground crumbling under the force. Golden moments that you don’t tire off. Explosions can be massive, there can be 100’s of enemies all firing at you, bullets ricocheting off walls, cars and other objects thrown at you…it’s all rather impressive especially as it’s got a cel shaded quality that makes it all look spiffy. There are a couple of flaws though. Driving is tricky as the driving model is pretty poor and the streets crowded. Killing locals attracts the police and it’s pretty unavoidable at times. The islands are also pretty small with not much variety. Speaking of variety, the biggest flaw is the lack of variation in killing the gang members. They increase in volume and difficulty and thats about it. Once you clear an island there are no gang members left. Once the game is completed you can turn gang members back on but not the gang bosses which takes some of the sandbox nature away. However there are time trial options in which you compete to kill bosses in the quickest way possible which adds some depth. 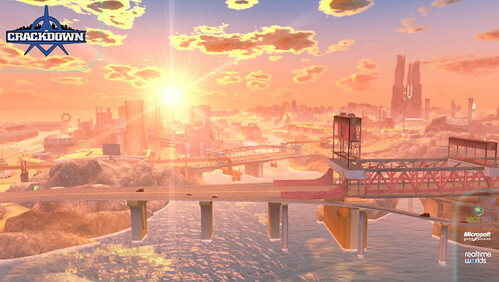 Online play is limited to 2 player co-op and uploading race times. The co-op is excellent and you are only limited to your own imagination in what you do…play the game, race, fight, horse around etc. You feel though that an eight or sixteen player multiplayer game would have been amazing. With the different weapons and skills, battles could have taken place over the whole map or just limited to one island. I would love to play capture the flag in this game against friends. I think thats my real gripe…it all feels rushed. Don’t get me wrong, I love the game but it’s as if they’ve finished the single player game and instead of developing multiplayer Microsoft have slapped in the carrot of Halo 3 beta which is admittedly a very big carrot…but this game could and should have been so much more. Already dev’s are talking about Crackdown 2 which like the Halo series will probably see the introduction of online multiplayer. Probably more expansive environments too…and taller. However it will be another game, another Â£50 and more evolution rather than revolution. Crackdown is highly recommended but bare in mind it will probably take two versions to truly deliver unless, like Gears of War, downloadable content will be used to deliver extra multiplayer goodness. Now – where is Ricky Dee? A guy at work is still trying to source a Wii so I gave CA Games a ring. Phone will not accept incoming calls. Oh – thats strange – they must have changed their number. A quick visit to the website brought the sad news that they have gone out of business. Most gamers outside Glasgow probably don’t recognise CA Games but for me and a few friends it was THE import games shop in Glasgow. In a time before the internet had taken off it was the place to get import consoles and games at vastly inflated prices. Maybe it was the internet competition that finally did for the shop but there was many an hour spent in CA Games and many (too many) pounds spent in the pursuit of gaming happiness. Thats another local temptation that has been removed. Still, there’s always Loud and Clear if I feel the need for instant gadget gratification. Plus an Apple store coming soon. Saved. Can you survive a day without your computer? Then sign up to Shutdown Day. I know when it’s unplanned, having no internet or computer access can be annoying, even making me a bit cranky. So much of day to day life is now managed and aided online. Still, I’ll give it a go.